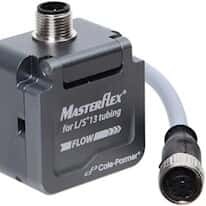 Ultrasonic flow meters measure the velocity of liquids. Transit-time and Doppler flow meters are the two-main ultrasonic flow meter types. While both are ultrasonic flow meters, they are different. A Doppler flow meter requires particulates or bubbles in the media. This type of flow meter is mainly used for liquid applications, but can be used for gas and steam applications. A transit-time flow meter requires a clean liquid without particulates or bubbles and can be used for both liquid and gas applications. We offer both ultrasonic flow meter types with a variety of options including clamp on, handheld, and portable models.